Converting funds from one currency to another is a core part of the international payments process. 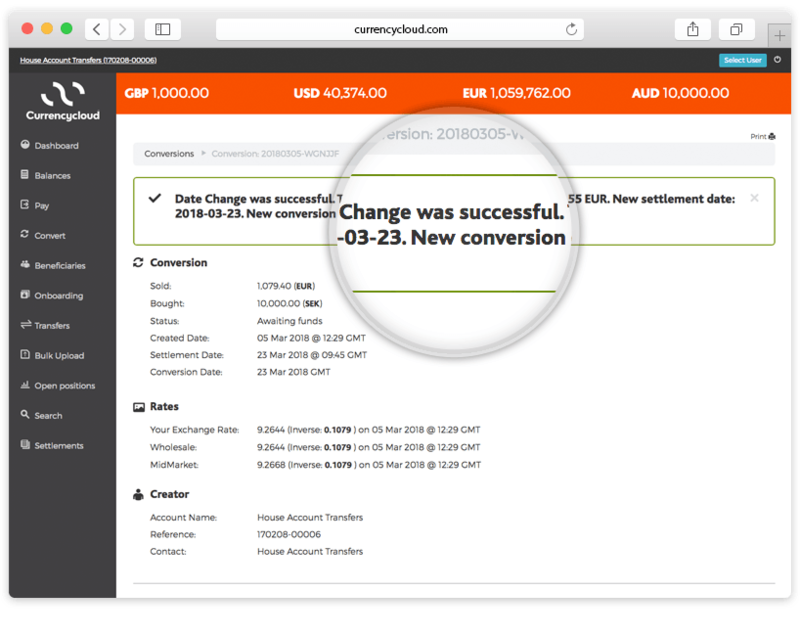 A set of new features has been created in order to offer full control of the conversion process, from the quoting to the creation, the update and all the way to the cancellation of a conversion. 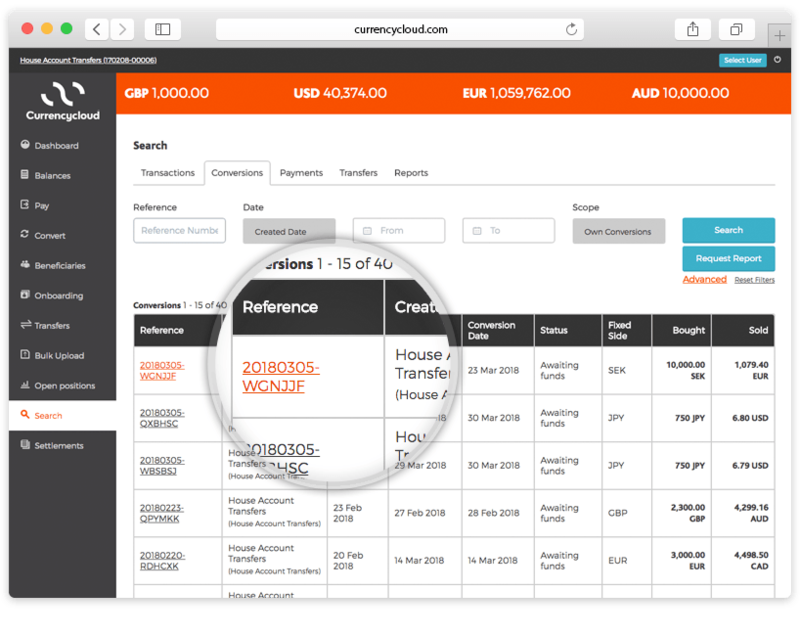 This functionality is available to the users with the relevant permissions and can be accessed through the conversion pages of Currencycloud Direct at any time, beyond normal business hours. This guide focuses on the conversion date change process, including quoting and realized profit & loss. 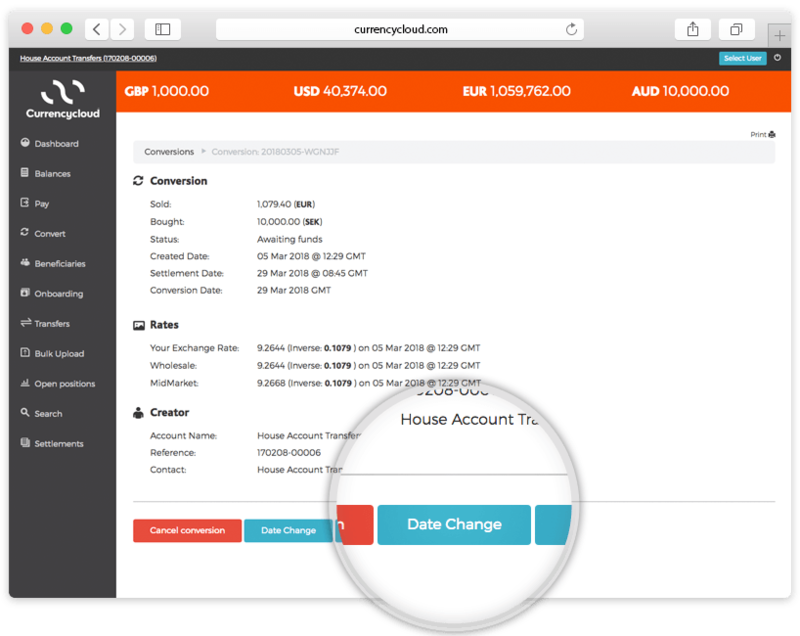 Conversion date change is a feature driven by permissions and is only available for House Account-level users. Users with this permission can change the date of conversions both on their own account as well as any of their sub-accounts. The feature is available both for users that are enabled or disabled for Currencycloud Account Balances. Note that only conversions that are in “Awaiting Funds” status can have their date changed through Currencycloud Direct. Use the “Conversions” tab on the “Search” page on Currencycloud Direct in order to find the conversion that needs date change, as shown in the screenshot below. Click to see the details of the conversion. If the conversion is in “Awaiting Funds” status and the user has the relevant “Conversion Date Change” permission, a “Date Change” button is available on the bottom of the screen as shown on the example below. By clicking on the “Date Change” button, the user gets to a new page where they can define the new date of the conversion and receive a quote on how much this date change costs. Note that if the cost is more than £1000 (or the equivalent amount in a different currency), the date change cannot be completed through the online application and Customer Support intervention is required. The user can always get a new more recent quote by clicking on the “Requote” button. Note that this is an estimation of the cost. By clicking the proceed button, the conversion date is updated and a confirmation message is shown to the user. 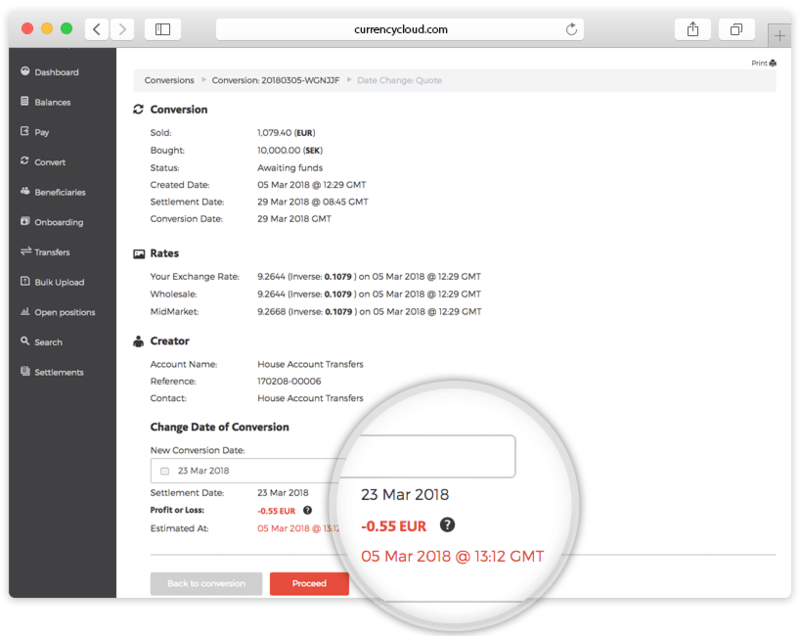 The profit or loss generated by the date change is always available on the corresponding conversion page for the users, who have the conversion date change permission, to view.